They will be heavier than the lightweight models that previously have hit people on the ground. A host of questions remain unanswered. Should drones themselves be required to carry safety features such as sensors or parachutes? Are Americans willing to endure drone accidents in exchange for more convenience and freedom, as they do with automobiles? The out-of-control photography drone that knocked a woman unconscious during Seattle’s 2015 Pride Parade, and the one that hit the top of the Space Needle the year after, had nowhere near the heft that future delivery drones will need. The first weighed under three pounds; the second, a shade under seven. 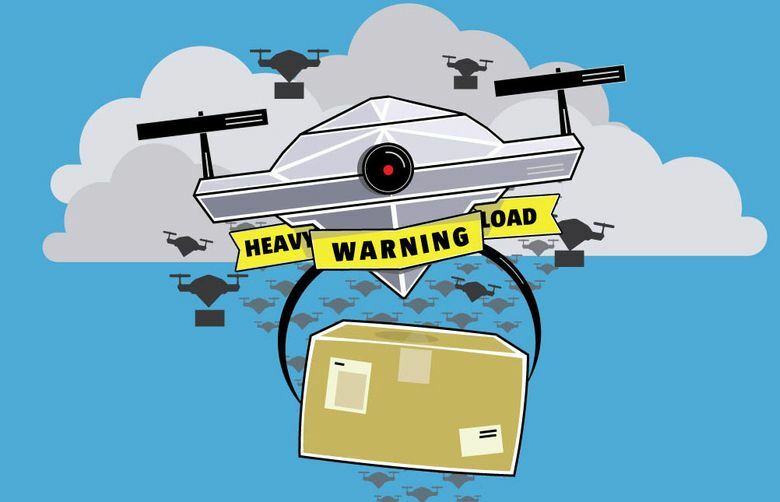 In the coming months, the U.S. will take important steps toward regular test flights by heavier, package-bearing delivery drones. Last month, the Federal Aviation Administration opened the door a little wider for flights over people, though not deliveries, in a new draft rule. As the weight goes up — one company is testing at 13 pounds — a fast-moving drone becomes more dangerous. Over time, middleweight business drones could outnumber the amateur-flown featherweights. One credible estimate predicts that in 20 years the U.S. will have at least 8 million drone deliveries a day. 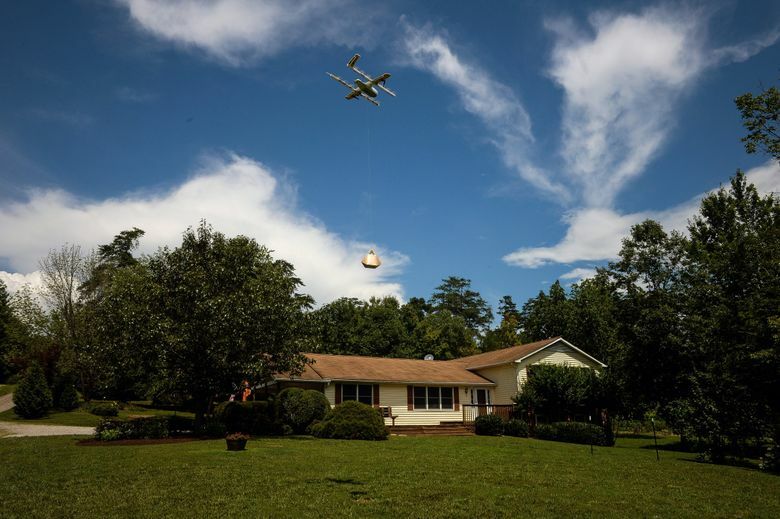 Both of the tech giants pursuing the drone-delivery business, Amazon and Wing, the unit of Google parent Alphabet, say they are ready to fly package-delivery drones with redundant safety systems. Until recently, what was safe enough remained unsettled. “The truth of the matter,” Juan J. Alonso, professor of aeronautics and astronautics at Stanford University testified before a House aviation subcommittee in late 2017, is that “no technologist knows what this required level of safety ought to be …” because it’s uncertain what level of risks and trade-offs society will tolerate. Last month, the FAA started filling in some of the blanks. In a new proposed rule for drone flights over people, the FAA based its safety approach on preventing serious injuries if the drone crashes into someone on the ground. The rule invites drone companies to design the drones or add safety features to limit the harm. A host of questions remain unanswered. Should drones themselves be required to carry safety features such as sensors or parachutes? Can the risk of hitting someone be significantly reduced by accurate flight-management systems that keep the drones on course? More broadly, are Americans willing to endure drone accidents in exchange for more convenience and freedom, as they do with automobiles? Or will the safety measures required to win public acceptance be too restrictive, heavy and costly to be acceptable to the big tech companies, aviation firms and startups hoping to see a payoff from drone commerce? 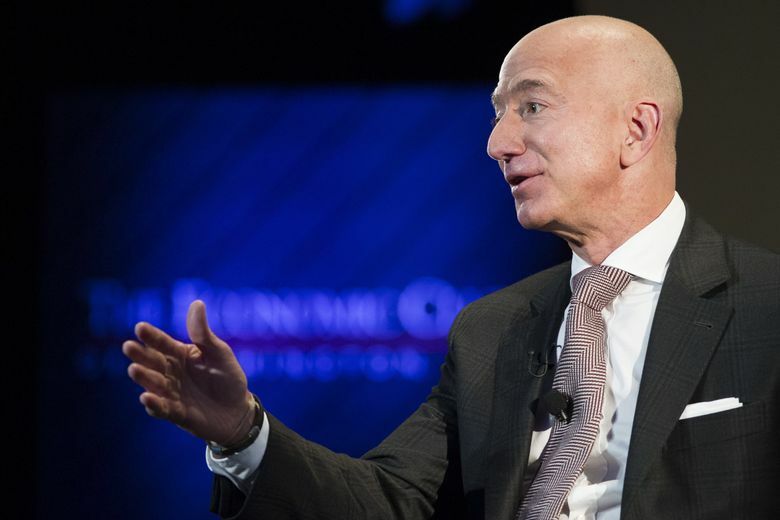 Amazon Chief Executive Jeff Bezos stirred excitement about deliveries in late 2013 when he predicted in a 60 Minutes interview that within three to five years, his company would be landing orders at American doorsteps 30 minutes after a customer hit the buy button. A company video dramatized the possibility. Given all Amazon had done, his prediction had an air of inevitability. But the FAA initially balked when Amazon wanted to start U.S. flight tests in 2015. To drone companies, the FAA seemed like a labyrinth of creaky bureaucrats. Shut out temporarily in the U.S., Amazon’s Prime Air unit did most of its testing outside the U.S. at development centers in Austria, France and Israel. 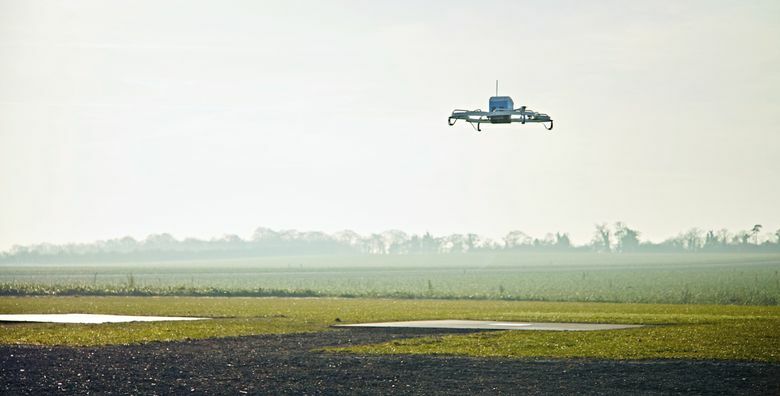 The company’s first pilotless, autonomous delivery flight was completed in Cambridgeshire, England, in late 2016. And Wing, which has tested in Australia, just started flying delivery drones as part of a test program in Finland. The current rules for drones under 55 pounds — adopted by the FAA in 2016 — are built on the idea of keeping people and drones apart by prohibiting flights over people, beyond the vision of the pilot or at night. And measured alongside the golden yardstick of passenger aviation — a safety success story — the drone industry is off to a good start. Although some illegal flights are being investigated as the cause of service shutdowns recently at London and Newark, N.J., airports, no one has been killed or severely hurt, even after hundreds of thousands of flights by lightweight, battery-powered consumer drones controlled by ham-handed amateur pilots. The FAA started commissioning a new program of drone research in 2016, using a scale of injuries devised for automobile accidents. Possibly because it wears two hats — safety watchdog and industry promoter — the FAA’s initial public presentation of its own sponsored ground collision safety report emphasized some good news in April 2017: The popular Phantom 3, a 2.7-pound drone made by Da Jiang International, packed less of a wallop when dropped on a human head than a block of wood or steel of the same weight, with much less potential for serious or severe injury. Other researchers had already started evaluating the danger of a heavier drone falling or going out of control, however, and the news was less cheering. 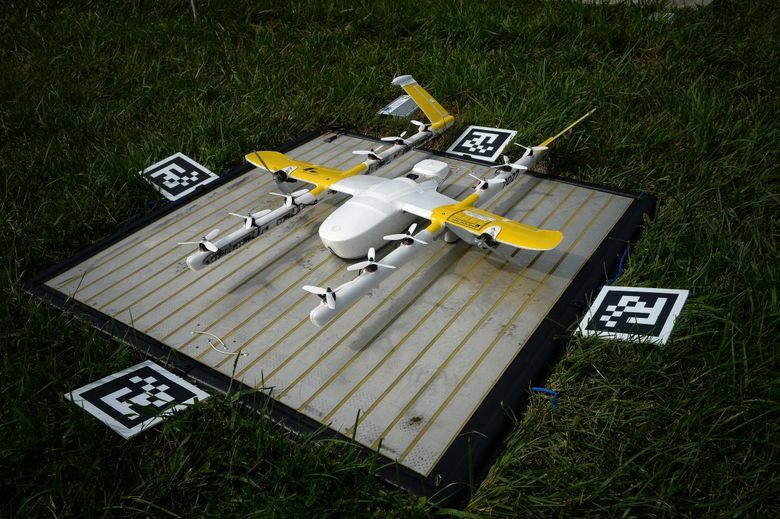 For example, a Virginia Polytechnic Institute and State University team carried out drone crash tests with sensor-embedded dummies. Writing in the Journal of Biomechanical Engineering, the researchers reported that models over 15 pounds had a higher than 50 percent risk of inflicting serious injury to the head and neck. The first level of safety in the FAA’s new proposed rule for flights over people would limit the mass and velocity to small drones that some in the industry believe would stop them from being used for anything more than photography and surveying. The maximum blow would be something short of a Harry Potter hardcover — say, Harry Potter and The Deathly Hallows, at 2.6 pounds — falling off a 4-foot-high table and hitting a tile floor. Only lightweight, fixed-wing drones of a pound or two could comply with such a conservative level, says Logan Campbell, president of drone-data consultant Aerotas. “Your traditional large multirotor drone doesn’t qualify,” he says. And although the rules don’t apply to deliveries, “no way you could deliver more than a pair of socks and still follow these rules,” Campbell says. A second, lower-safety threshold for flights over people, yielding the possibility of about twice as forceful a blow, would require drone operators to avoid crowds, stick to restricted areas and not hover over anyone. Since it’s hard to tweak a delivery drone to meet crash criteria for limiting injuries, the drone companies prefer to base their safety-performance rationale on the expectation of nearly flawless flying. The FAA hasn’t settled on a system yet to manage the massive number of anticipated drone flights, but flying drones would be safer if they are piloted or programmed to avoid crowded areas. To illustrate the different levels of risk, David Arterburn, head of the drone ground-level collision severity study conducted for the FAA’s drone Center of Excellence, and head of a rotorcraft program at the University of Alabama at Huntsville, used the example of a baseball stadium in his study. It has a sparsely populated outfield, busier infield and fans in closely spaced seats. “The probability of hitting anyone on the playing field was excruciatingly low,” he said last year on the fringes of an FAA drone conference. But when delivery drones finally are authorized to fly, their limited battery power means they may have to take the most efficient and direct path possible. And dropping off packages will involve closer proximity to power lines, streetlights and people. Some drones already come with detect-and-avoid features, but the exact combination of radar, optical and acoustic sensors or lasers needed for business drones isn’t settled yet. Engineers continue to improve and miniaturize the complicated combination of equipment and software for in-flight adjustments. Gur Kimchi, a leader of Amazon’s delivery-drone initiative, said last year that no delivery drone for his company should fly blind. But depending on drone size and wind, parachutes don’t guarantee that an out-of-control drone will float harmlessly to earth. Another problem with adding any onboard safety features is that their weight and power requirements affect many other drone components and capabilities: battery, rotors, wings, airframe, velocity, total maximum flight time and load-carrying potential. While onboard safety features can help cap the force of the collision, the added weight may limit the battery capacity or payload that determine the drone’s usefulness, said Gundlach. That affects performance, such as how long the drone can hover, he said. In other words, weight-limited drones will carry less cargo or sensors and fly shorter distances. Any weight for safety equipment will further limit the utility. Gundlach thinks skies busy with drones will pose less risk to the public, and produce fewer fatalities for the work accomplished, than ground transportation or small, privately operated airplanes now do. He said that a 5-ounce baseball is more likely to deliver a fatal blow than a small drone, especially since some drones have flexible, lightweight plastic parts that absorb energy in a crash. His views are similar to those of a team from the National Academies of Sciences, Engineering and Medicine, which issued a report last year criticizing the FAA staff for being overly preoccupied with possible drone accidents. 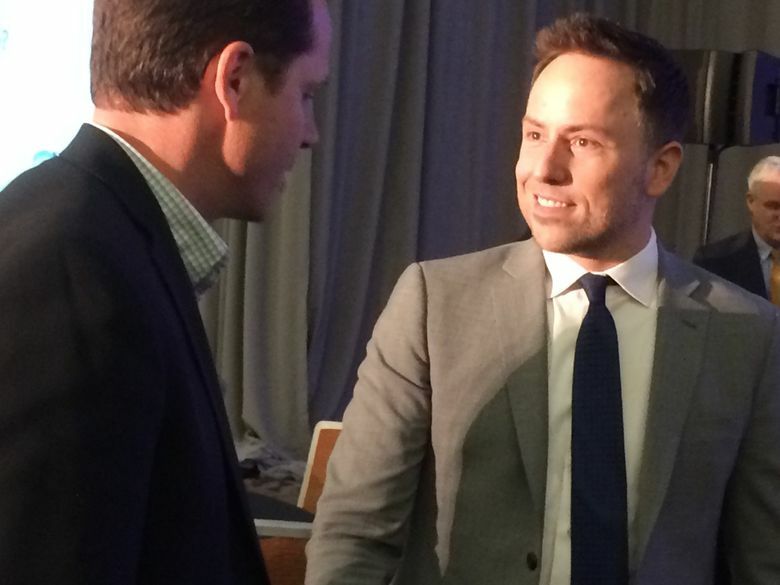 It urged the FAA to get out of the way of drone-industry innovators who can help create new businesses and jobs. The drone-delivery companies seem resigned to playing the long game, and it’s easy to understand why. Each “last-mile” package delivery completed using the U.S. Postal Service costs Amazon about $2.50, estimates a team of economists and drone experts who studied the issue in 2017. Retailers ought to be able to save about 76 cents with deliveries whose final miles involves a drone, says Bijan Vasigh, a professor of economics and finance at Embry-Riddle Aeronautical University, who was part that team. Some of the savings will come from one person monitoring several flights at a time. Years from now, drones that could make more than one delivery per flight may save retailers even more. So the testing and regulation-writing goes on. The FAA has not yet even asked for comments on its new proposed rule. For many in the drone industry, it goes on too long. Over time, many drone and aviation law veterans say, a new class of professional pilots monitoring partly autonomous commercial drone flights will come into its own — and the freewheeling era of drone flights will end. “Nothing terrible has happened and there have been virtually no serious incidents from tens and hundreds of thousands of drone flights,” said Henry H. Perritt, Jr. a pilot and professor at Chicago-Kent College of Law. 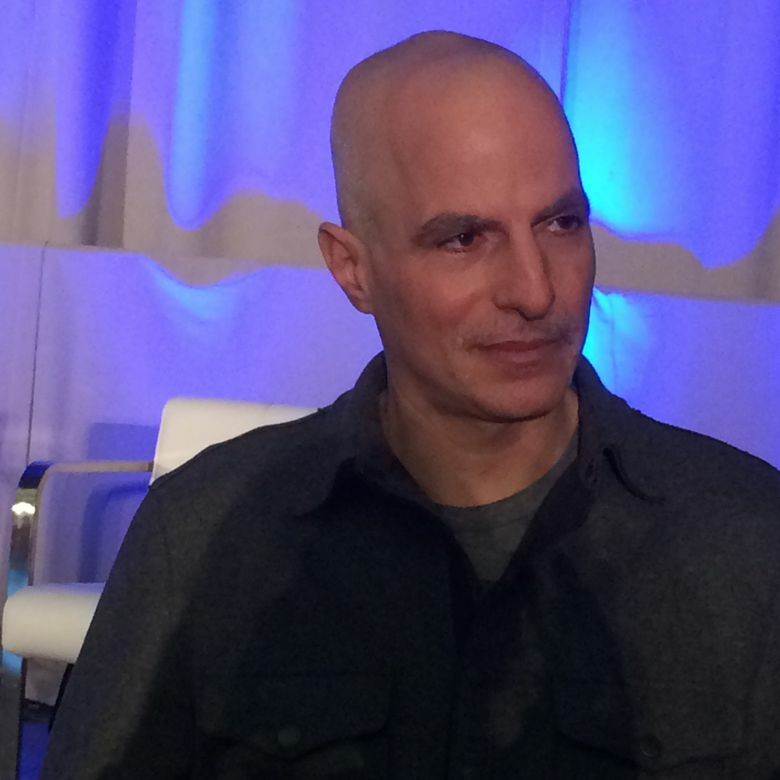 Reporting for this story was made possible by a grant from the McGraw Center for Business Journalism at the Craig Newmark Graduate School of Journalism at the City University of New York.